Music Magic And Games Show packages available through Children's Party Ents Ltd.
Music Magic And Games For Children's Parties and Corporate Events. If you choose this package, you can relax and enjoy the party as well, as your chosen entertainer will run the whole party for you. All you need to do is sort out the party food and drinks (approx halfway through) supply the Birthday cake and party bags. (If a Birthday party.) and we'll do the rest. This allows you to enjoy your child’s special occasion “stress-free”. Organise all the party games and competitions for you. Supply all the music needed, using their professional quality sound system, that has been thoroughly safety checked to PAT standards. Then they will perform an amazing fun & comedy magic show in which lots of helpers and the whole audience get involved. They will also supply any prizes required during the games and magic show. Our entertainers are professional, reliable, friendly and approachable. The kids will just love them, and you can relax knowing that your child will be the talk of the playground, and will have a party that they and their friends will remember for many years to come. 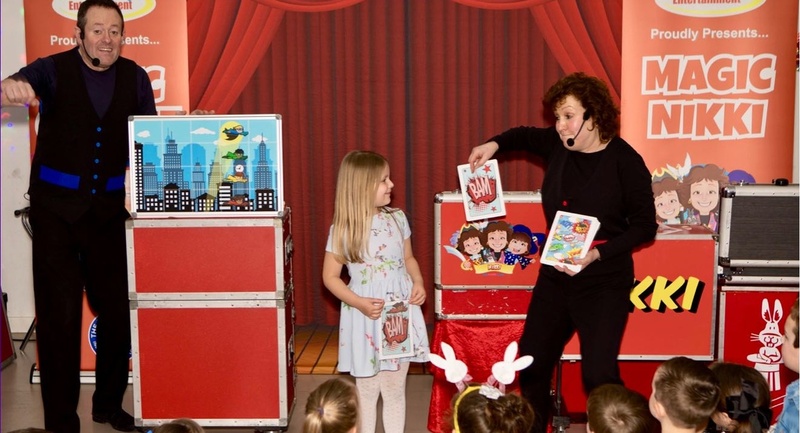 The 1.5 Hour Show- In this package, the entertainer will perform for 1.5 hours straight through and you feed the children at the end of the party. In this package, the entertainer will entertain for roughly 1 hour. Then there is a short break for you to feed the children halfway through. In this time the entertainment will play background music, keeping the atmosphere going as the children eat. Then as soon as the children have finished eating. They will resume the entertainment until the end of the party. Unlike other children's entertainers, we do not have a limit on the number of children invited to your party. The more the merrier.